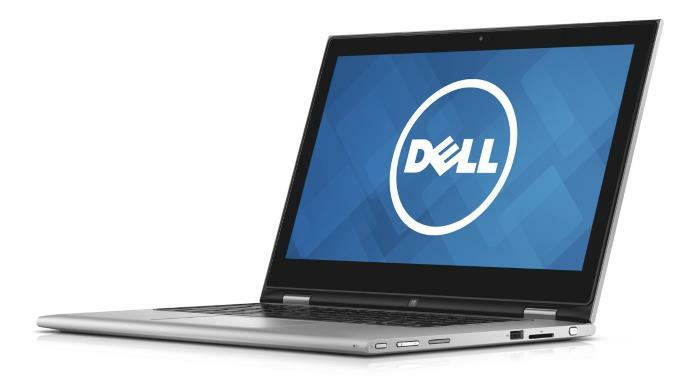 The Dell Inspiron 13 7000 7348 offers multi-mode laptop, tablet, and multimedia / presentation use. The device has a 13.3-inch wide viewing angle IPS display with either 1366-by-768 or sharper 1920×1080 Full HD resolution. Inside the silver-colored plastic chassis with 0.7″ thickness, weight of 3,7 pounds, and backlit keyboard in the center of it, Dell’s 7348 packs the Intel Core processors. It’s currently available with either the 4th Generation Intel Core i3-4010U or the latest 5th Gen Core i5-5200U and i7-7500U. While the i3 is good enough for daily operations of the average user, the i5 and i7 add extra oomph for more comfortable video and photo editing and other demanding tasks. Furthermore, the 5th Gen Core CPUs has somewhat faster Intel HD 5500 integrated graphics instead of 4th Gen’s HD 4400. Both are however low-end graphics solutions, good for occasional games and select hardware-demanding titles on low settings. The convertible notebook comes with either 4 or 8 Gigabytes of system memory and a 500GB hard drive. Optionally, available is a 500GB hybrid HDD with additional 8GB of fast solid state drive-based cache for better responsiveness. As an extra perk not so often seen in similar devices, the Inspiron 13 7000 7348 includes a stylus pen, with a dedicated slot for it in the keyboard deck. The stylus isn’t an active digitizer pen with advanced features such as the one of the Microsoft Surface Pro 3, but rather a simple capacitive pen. The laptop features stereo speakers, a 720p webcam, Wi-Fi and Bluetooth connections, a full-size HDMI output, two USB 3.0 and a USB 2.0 port, and an SD/MMC media card reader. Dell hasn’t provided a battery life estimation for this model, which contains a 43WHr battery unit.